Can I name a card not in my deck when casting demonic consultation? Kess, Dissident Mage + tutor. Tutor for Demonic Consultation , cast Consultation and name Laboratory Maniac , recast consultation from the graveyard with Kess, naming something you don't have in your deck. 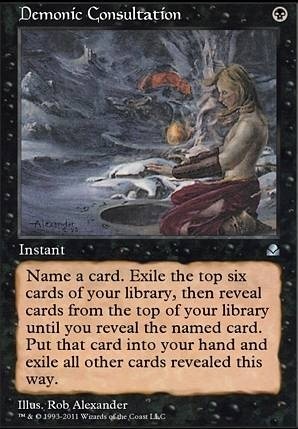 Exile deck, draw a card, win the game. In your opinion, do you think the Demonic Consultation / Tainted Pact Grixis list are better or the Thousand-Year Storm / Bonus Round list? ShutUpMokuba it is a two-card combo with Demonic Consultation and Tainted Pact . As for Niv Mizzet, I need to know the ruling on cards that contain (for example) UW, but are Numot, the Devastator , so aren't just UW, and if I could take that as the Azorius card in the pack. If so it is a 9/10, if not it is only a 5/10. I think we are in agreement. 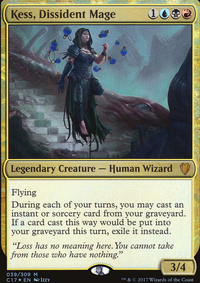 Wizards should print walkers that aren't busted in the command zone from time to time, but not just make all walkers commanders. I love Aminatou, Teferi (the one that can be your commander), the commander Saheeli, the Izzet partner commanders, etc. 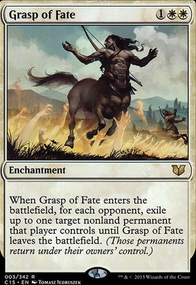 I just don't think retroactively adding the commander text to all walkers is smart. PlatinumOne I hope you didn't play in Theros Standard with Elspeth. It was a card that, due to its high mana cost, and lack of immediate impact, outside of a Captain's Call , wasn't expected to be strong. It took over standard, however, because if you didn't have creatures to deal with it, you'd die to tokens. If you didn't have creatures with trample, you'd get chump-blocked. If your creatures with trample don't have at least be ~4/4, they'd get triple blocked and killed. If the opponent DOES have those creatures, they get swept. There were weaknesses, small evasive creatures, with flying, etc. 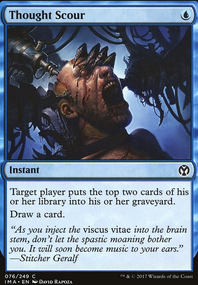 can get in, removal for walkers is strong, giving them just the Captain's Call of value, or just a sort-of sweeper. Counter it. Fine. You won't be able to beat it though because it is a commander. It can be recast. It has value forever and is incredibly potent. UW Control in Modern, most every white standard list at the time, etc. It has shown to be a potent card. I will say I agree with you on a lot. Kokusho, the Evening Star isn't a broken commander. It is a vulnerable deck, and isn't a strong deck compared to cEDH decks, nor is such a one-card engine like Elspeth that it can have a lackluster deck behind it and still do well in casual circles. 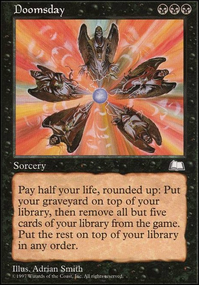 You need to run reanimation, and most good reanimation costs a lot of money, so the deck sort of requires the money that would generally place it in higher circles than the casual crowd. I only mentioned that cards like Doubling Season might be a problem for its price. Not effect. There are 20 worse combo enablers I can think of off of the top of my head. Laboratory Maniac / Demonic Consultation / Tainted Pact ... ugh. Anyway, for price concerns, I think you can see the issue, but if it got reprinted into the ground, along with Deepglow Skate / The Chain Veil , I would have no issues with it as a card. 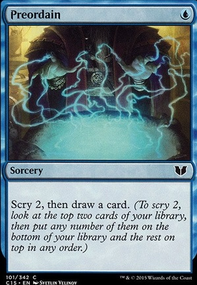 The only true combo I see being broken is Tezzeret the Seeker never has mono-blue had a commander fetch the whole of a combo on its own, with just mana to cast it. Arcum Dagsson takes artifact creatures, and roughly 20 more cards in the deck to go off than a Tezzeret the Seeker deck, and Teferi, Temporal Archmage being the only deck close to Tezzeret, of which Teferi being a tier 1 cEDH deck I'd argue is only about ~2/3rds the power of Tezzeret is the issue. If the best decks in the format are only ~2/3rds the power of a deck (up to debate of course), then that deck is the new best deck in the format, with no decks equal to it. Because of Fast mana and proper comboing, I expect this deck to average wins with interaction on turn 2-4. The average cEDH fast-combo deck can wins on turn 2-4 without interaction, and turns 3-5 with interaction from the opponents. I play mostly cEDH, and can say this deck is really scary. Against the current field I'd estimate a near 40% winrate, up from 25% for an average 4 player game. That is my fear. Can you at least say ban Tezzeret or just not get mhim to be a commander if we make this change? BTW Ugin sounds sweet as a commander. Good question! I'll start by citing Shaper's PST primer regarding Tainted Pact and Plunge into Darkness . "The absolute champion of inexpensive dig spells, this card was included since overall the deck is only looking to assemble 2 cards to win the game. Considering that Plunge into Darkness is specifically in line with digging for specific cards, we have included this card to improve the deck’s consistency. In testing, there are some worthwhile notes to share. The first is Plunge a little more conservatively than you would in a deck like Food Chain Tazri. It’s possible you plunge very deep (~30 cards) and then exile your win conditions looking for the card you need, so take care to factor in what else you need to create and utilize your infinite mana engine. On average, look to dig about 8-15 cards blind. If you have other parts in hand, then you can begin to increase your Plunge depth. Ideally, Plunge deep if you really just need a single card, and be more reserved the more parts you are missing. Worst case scenario on a miss, it will replace itself with another relevant card like more draw or a counterspell. " "We are very often looking for specifics, and this card again is a way to zip through the deck and find single cards with high consistency. Later on, when we talk about alternate packages, one of those includes Laboratory Maniac and Demonic Consultation , which will use this card as combo redundancy. However without Maniac it is another tutor thanks to the singleton manabase." TLDR; Tainted Pact should be treated as a mega Impulse or a straight up Demonic Tutor if you're willing to take the risk or you're in a position where exiling any cards from your deck won't matter. I'm not a fan of plunge personally since this deck relies so heavily on Ad Nauseam and to a lesser degree Bolas's Citadel that the life loss is a significant downside. It's still a reasonable inclusion if you're a fan of the card.